all forms described (see Bolton, 1995) . 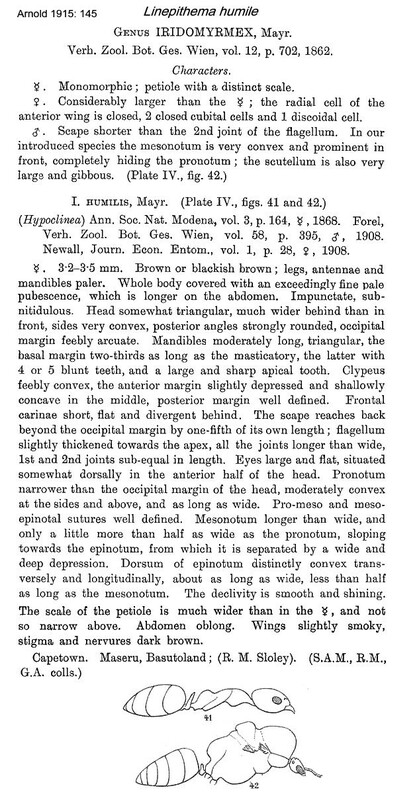 Mayr's (1868) description is at . Forel's (1908c) description of the male is at . 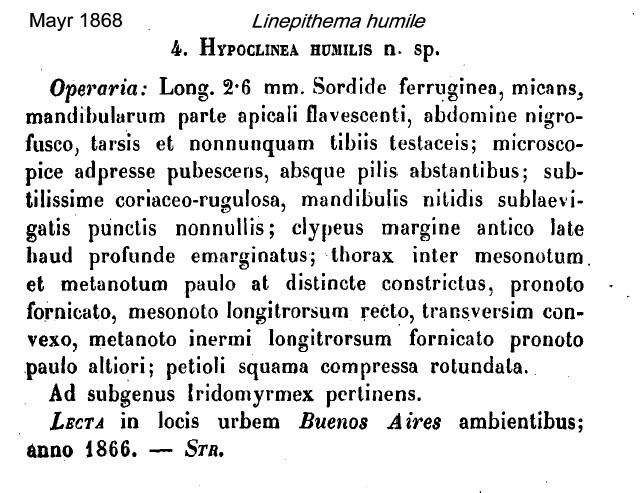 Arnold (1915: 145) gave an illustrated translation as Iridomyrmex humilis, this is at . Southern African findings were listed by Wheeler (1922: 922) under Iridomyrmex humilis; from Lesotho, Maseru, by R M Sloley; and, South Africa, Cape Town, by Bingham, G Arnold & H Brauns - see a worker at http://www.antweb.org/specimenImages.do?code=casent0280869. See The Global Invasive Species Database for more information. The photomontage of the type worker is collated from http://www.antweb.org/specimen.do?name=casent0915577. The photomontage is of specimens from Portugal, Lisbon, approximately 5km inland, at W 9�'30", N 38�',8", collector Markus Eichhorn and students.